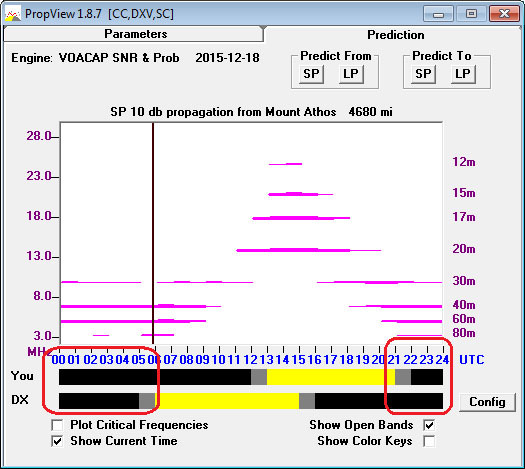 After generating a prediction, uncheck the Prediction tab's Plot Critical Frequencies box and check its Show Open Bands and Show Current Time boxes. The forecast is a graph of frequency on the vertical axis vs. UTC time on the horizontal axis. Frequencies are labeled in megahertz along the left side of the forecast, and in meters along the right side. You can use your mouse to drag the time line to the left or right to make it easier to see exactly when openings strengthen or weaken. Doing so will uncheck the Show Current Time box; checking this box will return the time line to depicting the current time. The 2F2 shown above means that propagation involves two F2 layer hops. You can immediately generate a long path forecast by clicking the Predict From panel's LP button; this panel is located in the Prediction panel's upper-right corner. Now you can select the Main window's Prediction panel and generate short path or long path forecasts for your signal strength by clicking the Predict To panel's SP or LP buttons respectively. If after you initiate a forecast, the Prediction tab of PropView's Main window displays ...computing but never produces the requested forecast, enable short filenames in Windows.